Well, I never really figured out what I was planning on posting yesterday but today I do have something - hopefully it will be interesting! Have I ever mentioned that I can be a bit of a klutz at times? It seems like if some weird, freaky accident can happen to me - it does! Well, yesterday was a good example of just that. I was just finishing up my shower. I had the towel and was drying off and getting ready to walk out of the shower - the door was open and everything. Then. . . I dropped the towel. Bending down to get the towel was not a problem but straightening up again . . . I hit the shower door with my head. There was blood - actually, there was a lot of blood. I split my head open - about an inch and a half long and up in my hair so it isn't really visible unless you look. It seemed like the blood was never going to stop so I called up Mom to see just when you needed stitches. My hair was turning a nice reddish color (maybe I will try being a redhead sometime!) and there was blood running down my cheek and my neck. After several minutes of applying pressure to the cut, the bleeding stopped - well, it slowed to a very slow ooze and then stopped a while later. After examining things and consulting with Mom and Dad I decided I didn't need stitches - just a softer shower door! Cleaning up the blood ended up being the worst thing. I got lightheaded and ended up going to bed. This was in addition to the headache I had from actually hitting my head. What a morning! To make things even more interesting, I had an appointment to get my hair cut yesterday afternoon! Luckily, everything went fine and great care was taken around my cut. Did I mention that I am planning on letting my hair grow out? It has been short for quite a while and it is time for a change. Of course, when your hair is SHORT like mine is, the only real change you can do is to let it grow so . . . that is the plan. We will see how long I can stand it before having it all cut off! Hopefully, I will make it to a bob! I think that I will have to "document" the growth of my hair. Of course, I don't have a photo for you today - this morning my hair is all "Bed-head" so I will wait until I am having a good hair day to show you! At least Skor had a good time yesterday! Voice Update: Well, I didn't really do everything I planned to do yesterday - including my vocal exercises. I will be back on track today as long as there isn't any blood! What Was I Going to Blog About? Well - it has been a busy couple of days for me so that means . . . sadly . . . no blogging! That is the way the old cookie crumbles, I guess! You will be proud of me though- despite the busy days I have continued to walk each morning and do my weight routine. I even walked with Hubby once in the past three days! Yeah! It is funny - when I wasn't able to blog because I was away from home I had all kinds of ideas of things to blog about. However, now that I am actually here in front of the computer . . . . they are all gone! Sooo - I guess I will just post this short blurb for now. Maybe later I will remember something important to blog about. . . .
Voice Update: Still doing well with the massage and the exercises - the oral reading is getting hit by my busy days . . . not too good. I think my voice is still doing well. Look Who Says "Good Morning!" This lovely spider was kind enough to greet me during my morning walk this morning. Luckily, he/she didn't jump out at me but hung peacefully on his/her web and just waved a couple yellow and brown striped legs in my direction. Maybe it is because Halloween is coming up shortly but, for some reason, I have been fascinated with spiders and spider webs lately. It began with the spider web in my front yard. Sadly, the Terminex guy "took care of" that web. The spider tried to build again but the recent rain frustrated its efforts. Then - I saw a huge web this morning with this friendly little spider sitting in the middle of it. I had to stop and look. Amazing - isn't it? Of course, it is amazing in the wild. In its web. Not in my house. Or, heaven forbid - in my bed! Anyway - I walked again today despite my knees telling me that they would rather stay snug in bed. It isn't actually my knees - it is the muscles directly above my knees but not my thigh muscles. They protested pretty much the entire time. Oh well! After walking I trooped upstairs and did day two of my weight routine. Oh yeah! My muscles will love me tonight! It is good for me, right? Do you remember a while back when I told you about the podcast book I was listening to? The first book was Shadowmagic. Then I started listening to the sequel, The Prince of Hazel and Oak. Both books are very good and I highly recommend them to you for your listening pleasure. Or, if you prefer, you can get the first book in print. Just google it and find the author's page or find the book on Amazon. Recently I started listening to another podcast book called The Spiral Tattoo by Michael J. Parry. This book is about a pair of law enforcement officers, a fairy and a troll. Different, yes, but so far, very interesting. I am hooked. If you are interested in looking at these books or other books you can get as podcasts (for free!!) you can check out a website called Podiobooks. It has podcast books of all genres. Okay, end of commercial! I just really have enjoyed these podcast books and think that you would too! Voice Update: Still on track. Last night I didn't quite get in my entire hour of oral reading because I wanted to get my papers typed up for class but, I did at least a half hour! I know, I know. Not good enough. However, it is a start, don't you think? As you may have gathered from my profile picture, I am a little . . . . fluffy. This is something that I keep telling myself that I am working on. After all - I have been the walking queen for a while and I was the walking/swimming queen this summer. Of course, the two or three week break I have been on - not good for the anti-fluffy movement. Sooo . . .in an effort to get back on track with my walking I headed out this morning. It was still dark! I don't like the dark. It is scary. Who knows what can be hiding in the shadows. Cars zooming by on the street might not be able to see my bright white shirt and the reflector strips on my tennis shoes. It is dark! I don't like the dark! Anyway - I actually completed my walk and then . . . I decided it was time to start my weight routine again since I am not swimming. So - I trooped up to the bonus room, got out my instruction sheet (from Oprah a long time ago) on the ten minute weight routine (written by Oprah's exercise guru). Okay. To be honest, it was a good idea which was a long time coming. BUT - can I just say I am a wimp? My arms are already achy and it has only been about half an hour! I can't imagine what it will be like later! I am hoping that I can be stubborn enough to keep walking and doing weights. On certain days this might be difficult due to early observation assignments but - I can walk later - right? I wanted to show you that the birds have come back to Texas for the winter. They are everywhere! This is a wonderful building in Fort Worth - I have no idea what in the world it is but . . . cool! Why was I in Fort Worth? Tarrant County College (the community college in Fort Worth) has an ASL/Interpreter Preparation Program and they held something called "It's a Deaf, Deaf, World." This was an event in which "real life" activities such as banking, visiting the doctor, attending church, and several other activities were recreated and student and community members go through the activities relying only on sign language. There was no spoken English allowed. In fact, if you were seen to be speaking, you were taken to "jail!" Let me tell you - this was a wonderful event to attend. It really makes you use those ASL skills and gives you a glimpse inside the Deaf world. The most impressive activity was called "The Deaf/Blind Experience." In this activity you are blindfolded so you can't see anything and then, still relying on sign language, an interpreter takes you to do an activity (I was thrown into jail!). You might wonder how you use sign language if you can't see. Well, to talk it is easy since you can still form the signs. Understanding what you are being told, however, is a bit tricky. You basically rest your hands on the hands of an interpreter to feel him/her signing. This is HARD! Just think that there are people in this world whose entire life is spent like this. Wow- I am impressed with the tenacity of those people! *** By the way, the experience was NOT in the building pictured. I just passed it on the way home and thought it was neat. Okay - I am going now. Have lots of stuff to do! Voice Update: Okay - you will be proud of me. Not only have I been doing my exercises and massage but . . . yesterday I did my hour of oral reading! YEAH! I got through the book of Isaiah and into Jeremiah. Let's keep our fingers crossed that I keep this up! I searched and searched for a picture to add to today's post but . . . no luck so . . . you are just going to have to settle for the typed word today! De feet. For years I have had problems with "de feet." What kind of problems? Well, let me tell you! For as long as I can remember my heels have caused me problems. They get extremely dry and crack. Sometimes those cracks can get so deep that they bleed and hurt really, really bad! When the cracks are really bad, it hurts to walk! I have tried all kinds of different lotions and creams to remedy this situation. Udder cream. Crack cream (yes, they do have such a thing!). Vaseline. Various hand lotions. Specialized heel creams from specialized foot magazines (yes, they do have such a thing as those too!). Nothing really works for too long. The best I have found is the special cream from the foot magazine (Foot Smart, I believe). I even bought the special "socks" which have a gel insert in the heel and are toe less. These socks can be worn overnight without the fear of getting "goop" all over the sheets while I sleep. They actually work pretty well. IF you remember to apply the cream pretty much EVERY night. Well- I guess it would be if you were the kind of person who can actually remember to do that every single night. AND if you didn't mind wearing the "socks" every night even though your feet get really hot during the night with them on. Well, let me tell you - I am currently paying the price for my "forgetfulness!" So - last night - after whining a little bit about my heel hurting - I got out the cream and the sock and slathered away. I still have the socks on as I am typing this - hoping that some more soothing moisture seeps in during this time. It will take at least another two or three nights before the heel in questions softens up enough to quit bothering me. Do you have any "magic" solutions? Voice Update: Doing well, doing well! I was massaging away this morning and I think I am managing to keep my throat pretty loose. We will see what happens in the next few weeks until I see Susan again. Six weeks is a long time between appointments! When I was a little girl I was shy. 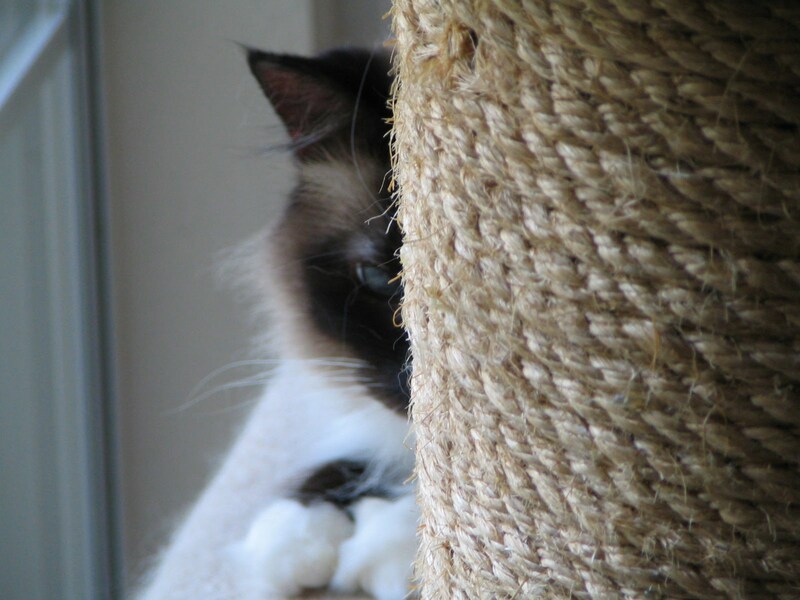 Very shy. I didn't like talking to other people and would much have preferred to stay in my comfort zone with my books and my own imagination as company. To friends and family I could be outgoing and even obnoxious (I am sure!) but, put me in front of people . . . and the shyness kicked in. Soon, Mom must have decided that she had to do something about the shyness. This isn't something that we ever discussed at the time (we have since I have been an adult though) but I found myself in situations where I had to talk to people. One distinct memory I have of Mom's "anti-shyness" efforts was when I was at a meeting for Rainbow Girls and there were many high ranking officials there. Mom took me aside and told me to go talk to one of them (probably the most important person there). I responded that I really didn't want to. Mom's answer? It was along the lines of "You WILL go and talk to so-and-so!" And - off I went with my heart pounding in my chest like it wanted out - fast. Yes, I managed to talk to that person and many others through the years. Now, I can talk to anyone - no matter how important or how scary looking. In fact, many people claim that I would talk to the wall if it would talk back. Most people who meet me these days have a difficult (if not impossible) time imagining me as shy. They say that there is no way I wasn't born with the outgoing personality that I show in public. I am happy that people think I am outgoing. I am happy that I can talk to people in all different kinds of situations. I just wish it was easier for me to do so! Even though I appear outgoing and friendly, the inside Trisha is still quivering with fear and dread at the mere thought of approaching new people and new situations. A tight knot forms in my stomach and a lump firmly lodges itself into my SD throat. To get through these feelings takes a lot of energy. However, I am so used to doing it by now that I hardly notice the energy demand. Until I get home, that is. Then I feel tired and cranky and just want to be left alone. With all of the different situations I have been going into lately for my observations and all of the new people I am meeting, I guess it isn't too surprising that I fall into a "funk" once in a while. It is just that I need to find a way to shorten the funky duration! Voice Update: Still going strong! I am proud of myself - I am doing great with the massage and the exercises. SD and I are dancing along smoothly - no trod upon toes! How I envy my kitties. It seems like they can fall asleep just about anywhere - in any position - and get a good sleep. Okay - I just woke up. Well, actually, I just woke up again. I originally got up at about 6:45 when the cats - who look so darn innocent in the picture above - came in to wake me up and wouldn't let me sleep any more. They were not happy with the amount of food left in their bowls. Apparently nothing less than 1/2 full will do for a breakfast nosh! Anyway - I got up. Got the papers (there are two on Thursdays the Dallas paper and a local paper). Spent a few minutes looking up at the stars still visible in the sky. How nice to see them. Went in. Read the comics. Ate some breakfast. Went back to bed. Managed to sleep for about 10 minutes before getting a phone call from someone from class asking a question. Slept for another 30 minutes before the alarm went off and scared me awake. Why do I feel so tired and slow? I know that part of the problem is that Hubby has been gone (he comes back today!!!!) and I always have some problems sleeping when he isn't there snoring away. However, that normally lasts for the first night only. Possibly, the "funk" I have been feeling is more physically rooted than mentally rooted like I thought. Hopefully, the funk will dissapate during the day and I will be back to normal soon! I am not enjoying this funk at all! Voice Update: Despite the funk I am still sticking to my voice routine. Each time I get in the car I do my exercises and then I massage my throat each and every morning and evening when I put on lotion. It seems to be paying off. This morning I feel a little more "with it" but not a whole lot! For some reason I was just "off" all day yesterday - which made it difficult to concentrate in lab and then hard to handle the constructive criticism in class. Have you had days like that? When anything anyone says to you is just taken too personally - not because of how they say it or what they say but just because of the way you are feeling at that time? Anyway - hopefully, today will be much, much better! I have an observation scheduled for 11:00 so I am getting ready to go soon. My rant for today is all about defrosting stuff in the fridge. On Sunday Hubby and I went through the fridge and the freezer checking our supplies and making a shopping list for the grocery store. At that time I spied some pre-marinated fajita meat that I decided to take out so I could grill it on Tuesday. The meat was all vacuum packed so there was no need to put the package on a plate while it defrosted - right? Yesterday I came home from class and was all ready to get the meat out to grill. I went out to the patio and got the grill going and then into the kitchen to get the meat out. Let me tell you - more "juice" came out of that sealed package than I thought was possible. The entire shelf (luckily it was the kind that contains spills) was covered with a layer of "juice." Meat juice. Yuck! This was the shelf on which the cartons of milk, orange juice, grape juice, etc. live. Let me tell you - those cartons can only take so much moisture before they start to absorb stuff. Gross looking stuff. I only hope that nothing actually made it through the carton and into the contents - now THAT would be disgusting! There was also a carton of six beer bottles on that shelf. The carton managed to fuse itself to the shelf. Nice. So - my simple task of getting the meat and slapping it on the grill turned into a major fridge cleaning event. First I did get the meat and get it on the grill and then I returned to face the clean up. After sacrificing many, many paper towels to the great meat juice spill of 2010, I managed to get enough of the shelf dried off so I could take it out of the fridge to wash it. In the process I had to dry off each and every item on the shelf (and look at the cartons hoping that they weren't contaminated!). Then it was into a sink of hot, soapy water for the shelf. After about half an hour of working I had the shelf clean, dry and back into the fridge with its contents cleaned off and back on the shelf. All that trouble for some fajita meat! I guess I should say that the meat grilled perfectly and was very good on my salad for dinner! I hope today is MUCH better than my day was yesterday! Voice Update: I am still a good girl - doing my exercises and massage. My voice seems to be responding pretty well - unless people are asking me about my voice and then it acts up just to "show off." Having a "dance partner" like this is just annoying sometimes! This morning came WAY too early for me. Last night I was at an observation until about 8:00 and so when I finally got home and had some dinner (prepared by hubby) and relaxed, it was time to go to bed! Of course, I put it off some because I needed to have some time with the kitties (they like it when I sit down with them and pet both of them at the same time) and some play time with Skor (to hopefully wear him out so he leaves me alone during the night!). Just when I was ready to nod off while on the living room floor, I realized that I needed to wash my face, brush my teeth, and prepare for bed. Reluctantly I heaved myself off the floor, plodded into the bathroom and started taking care of what I needed to do. Why doesn't the water in the sink get warm quicker? Washing my face with cool to lukewarm water isn't particularly inviting. Once everything was ready I played "try to keep Skor and his toy out of the bathroom so I have some privacy." Let's just say that I very, very rarely win that game. After a final burst of playtime for Skor, Hubby put up the toy (Mr. Sparkly) and we both settled in bed for the night. It seemed like Hubby was snoring away in mere seconds but me - I was tossing and turning trying to get comfortable. Then, when I found a good position for my body, my mind kept running and running and running. I spent another good while trying to focus on something to get my mind calmed down (it ended up being a weird story about being a famous singer/ice-skater/ballerina whose feet were injured - due to the fact that my feet were slathered with cream and encased in special moisturizing socks). Anyway - soon I was in dreamland. My dreams last night seemed to center around grilling outside for some odd reason. Then - it was morning. Just like that. Without any warning. Hubby's alarm went off. A full hour earlier than usual (due to his "field trip" for work which left this morning at 6:45). Ugh! Since the alarm went off, that meant that it was time for Skor to wake me up (who needs an alarm clock of my own??). Let's just say that I was certainly NOT ready to get up yet. After Skor got frustrated by my lack of movement he left (to call in reinforcements) and I listened to the sounds of Hubby getting ready for work (with my eyes closed). It wasn't too long before Skor was back. With Miss Cleo. You need to understand that Skor - while not very subtle - tends to be easy to ignore (until he starts massaging my face with his claws!). Miss Cleo will NOT be ignored. For such a small cat (in stature, not weight), she certainly has a hard head. Which butts against available parts of my body in her efforts to get attention. Being head-butted in the kidney is my particular favorite. It is right up there with having her massage my bladder first thing in the morning (Oy!). So - the situation is that I am in bed desperately trying to remain asleep. Hubby is in the bathroom getting ready for work and occasionally asking me questions (all of which I managed to answer intelligently). Both cats are now on the bed working on getting me up (they are certain that if Hubby is up and I am not - I MUST be late!). Don't you wish you were me this morning? Hubby finally headed out to the kitchen for breakfast and he fed the kitties. Hearing that magic sound of food hitting the bowls caused both kitties to speed out of the bedroom like their tails were on fire. I managed to nap for a bit until Hubby was ready to leave. Since he is headed out for a while on his "field trip" I wanted to say goodbye. After Hubby left the kitties apparently gave up on me (either that or they were so full from the food fest that they just had to rest a bit) and they let me sleep for another 45 minutes - until my "normal" time to get up. Then - right before the alarm went off - Skor came in to wake me up once and for all. He manages this by getting in between me and the alarm clock so I can't turn the blasted thing off (which is the loudest alarm I could find at the time I purchased it) for at least an entire minute. After that - I am awake. Luckily, once I am awake, I am fully awake. Hubby hates this fact. I wake up ready to talk and laugh and start the day. Hubby - he starts the day out more . . . gradually. I got out of bed and got dressed to walk (the first time in a while since I have been leaving the house early for observations). Next I headed to the kitchen for breakfast and then hit the sidewalk. Let me just say it was the perfect morning for walking. It was about 67 degrees when I woke up and there was a light breeze. I didn't start sweating until about 3/4 of the way through the way and that, my friends, is a wonderful treat! The sun and the clouds put on a nice welcome to the day and I got to rubber-neck to see all of the Halloween decorations in the neighborhood. Is it just me or are people getting more into Halloween these days? I don't seem to remember too many people decorating for Halloween when I was a kiddo. Maybe it is just the mass marketing of Halloween decorations which has jump-started the trend. Anyway - after finishing my walk, spending about 5 minutes petting a kitty who was outside (please, please, please keep your kitties inside. They live much longer and healthier lives inside than they do outside! ), and watering my flowerbeds and tomato crop (have I told you about that? I have about 8 little green tomatoes on the plant and I am pretty sure they will all get they chance to ripen before the end of our season here! ), I came in, sat at the computer, and started taking the hem out of the right leg of my walking pants. Voice Update: Believe it or not I am being VERY good! I am still doing my exercises each and every time I get into the car (I mute the radio until I am done so I don't get distracted!) and I do my throat massage every morning and evening when putting on lotion after washing my face. I have been hearing a few weird breaks in my voice lately but I attribute those more to stress (meeting new people and going to unfamiliar places is not something that I really enjoy. However, it is something I must do for my observations! )than to any real problem with my voice. Now all I need to do is get that oral reading going again. Well, it has been a busy couple of days around here - observation wise! I still don't know how in the world I will ever reach 200 hours of observation. Right now I have 73 or so and that is close to the most anyone in class has . . . . eeks!!! The observations are priceless though. Learning the different kinds of things American Sign Language Interpreters face in their jobs is something that will certainly help me in the future! Beyond observations I have managed to do a little cleaning around the house, some shopping (grocery and two pair of shoes I will show you next time), and some decorating for Halloween. 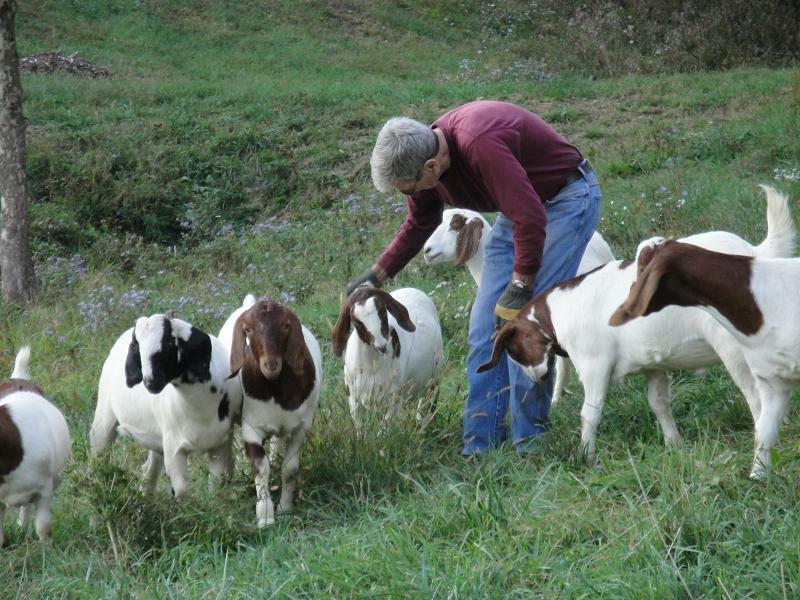 But first - check out what Skor was just doing. I heard some "scooting" sounds from the kitchen, went out and found this! Skor was in the process of taking apart the water fountain! Besides taking it apart he had managed to scoot the fountain into the middle of the floor - normally it goes beside the bowls against the back of the refrigerator! When I got out to the kitchen - Skor just sat there looking mildly guilty! Up next is my Halloween decorating and this, my friends. . . is pretty much it! Oh - I did put up a Halloween flag too but don't have a picture of it! Anyway - Bones here is so much fun - he is steel colored and when the wind blows his arms and legs . . . . he sounds like wind chimes! And then there is this lovely spider in his/her web! Here the spider is pretty curled up - he/she saw me and curled right up. The web is something amazing to see - it is at least two feet across and two feet long. It is attached on the top corners to our tree and a neighbor's tree and the lower corners are attached to the ground! In fact, the way I saw this spider in the first place is that I almost ran into it! The spider is about eye-height to me (for the picture I tried a different angle to get a good short of the spider) so imagine my surprise when I came "face-to-face" with this! I decided that the spider and the web were good Halloween decorations for my yard and best of all - they are free! 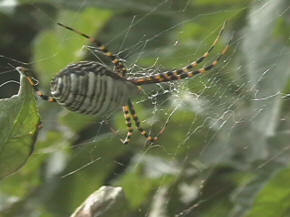 ****Editor's note - the picture of the spider is several days old. This morning, when I went to water the plants in the front, the web was still there but the spider is MIA. From the hole in the middle of the web I would say that something got it. Rats! Back to Skor. Hubby just had to take a picture of the kitty sleeping under the rocking chair last night! It never ceases to amaze me. Such a little bugger and he looks so innocent when he is sleeping! That is about it from here for now. I am going to call and see if I can get some observation jobs for this weekend and Monday! Voice Update: My voice is doing well. I am still on track with my exercises AND my massage! Yeah! I am quite proud of my efforts (even though I am sure Susan would like me to do even more!) despite the fact that I haven't gotten back into my oral reading. I think my voice would benefit from that so . . . that is my next goal - get back to the Bible. Besides, I need to know how the thing turns out, right?? Yesterday I went to a Memorial Service for a very special woman. Connie Redwine was a mother and substitute teacher at McCoy Elementary - the school I worked at prior to resigning due to my SD. In fact, Connie was my substitute while I took medical leave to figure out what was going on with my voice. She was a wonderful woman. I wrote this in remembrance of Connie. When I first came to McCoy Elementary, it seemed like everyone knew who Connie Redwine was. No matter who I talked to, they knew Connie as a loving mother of Paige, a hardworking PTA member, or a trustworthy substitute teacher. I don't think I ever talked to anyone who had anything but good things to say about Connie. Once I learned who she was, I don't think I ever saw her without a smile upon her face. After four years or so of casual conversations in the teachers' lounge during lunch hours and several brief written interactions regarding substitute teaching assignments, I finally got to know Connie better when I found myself faced with a very unwanted medical leave which eventually led to my resignation from teaching at McCoy. Connie Redwine agreed to be the substitute teacher for my class during my medical leave. Six weeks in a fifth grade class - that is enough to scare most substitutes and to put fear into the hearts of even the most experienced teachers. However, Connie stepped up for the job with a smile fixed upon her face. Yes, she admitted to me that she was a bit nervous but she still took the job. The six weeks started out with me writing lesson plans and just hoping that Connie would understand them. I would bring in new plans each week and I would sit down to talk with Connie about how the previous plans had gone. I discovered quickly that Connie really understood the children she was teaching. She could evaluate each child and his or her progress, or lack thereof, quickly and could make needed changes to the plans I wrote based on these evaluations. Connie wanted each and every child to learn and to do his or her best. I don't think I would be too far off if I said she looked at each child in the same way she would look at her own daughter. She wasn't just there to fill space, she was there to teach. She was there to care. It became clear during our weekly discussions that the students weren't the only people Connie cared about. She asked caring questions about my situation and was the perfect person to listen to my fears and frustrations. In fact, there were times that the two of us just sat as I sobbed at the prospect of not being able to return to teaching. Never did Connie make me feel uncomfortable or judged. She simply made me feel cared about and loved. Yes, she made me, a person whom she hadn't really had too much interaction with prior to this situation, feel loved. People often wonder if there are really such things as angels who walk among humans upon the earth. Personally, I don't question their existence. I know that they exist because I met one in that fifth grade portable at McCoy Elementary School. There is no other way I can explain the comfort, support, understanding, and love that I got from Connie Redwine. She was my "Earth Angel." The Connie I came to know , however briefly, during that time will forever be in my heart and I will eternally be thankful that God led her into my life just when I needed her. God Bless you, Connie. May you rest with God in his kingdom until we meet once more. Voice Update: Still on track with my exercises and massage so things are looking up! This weekend was our annual outing to the State Fair of Texas! I don't know that I had ever gone to the State Fair of Ohio when I lived there but, since the State Fair of Texas is in Dallas AND the musicals to which we have season tickets are held at the Music Hall at Fair Park . . . we go! Every year there is one musical held during the State Fair. This year it was Shrek! Having basically missed the entire Shrek mania when the first (and second and third) movie came out, I was a little in the dark about the plot. I will admit to doing a little research prior to the musical. I borrowed Shrek and Shrek 2 and watched them. Lovely little stories! 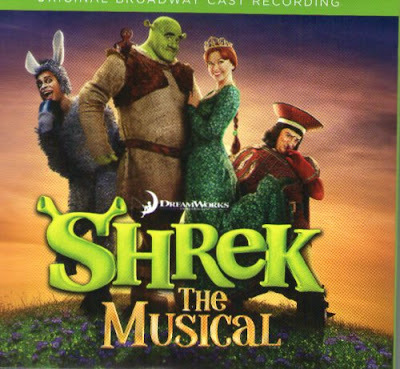 The musical was really a lot of fun despite the first big number (with Shrek in it) being a bit hard to understand. As the show progressed either the sound was adjusted or our ears adjusted because we could understand things more clearly. The set design was simple and yet very effective with huge swamp trees that moved around the set to indicate movement through the swamp/forest and backdrops forming the castle of Dulok and other locations. Costumes were amazing. Shrek's green skin really seemed to be a part of him and the fairy tale characters were cleverly done. I especially liked Pinocchio's costume which really did seem to make him wooden! Bright colors were everywhere making the stage cheery for most of the play. 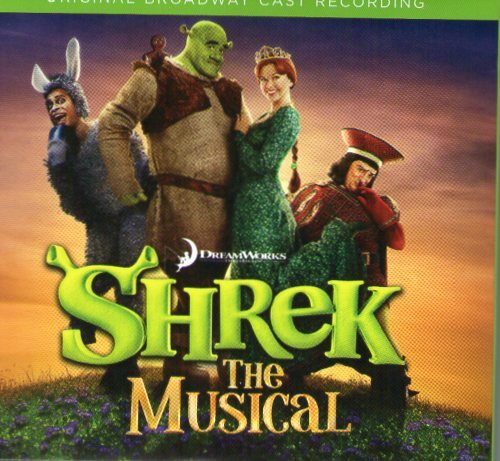 The parts of the musical which really hit me were clever references to other Broadway shows such as Wicked and Lion King which were not on the original musical soundtrack. Also, the musical tipped its hat to the Dallas area with references to local things such as "Jerry's World" and J.R. Ewing. Hubby particularly liked those references! Overall, the musical was a hit! It was fun for me as an adult and, from the enjoyment the children in the audience seemed to have, a winner with children as well! If it comes to your town, I would say - go and see it for a fun afternoon! After the musical it was time to enjoy the Fair. This is the icon of the state fair - Big Tex! He stands tall over the fairgrounds (and the famous Fletcher's corn dog stand) and even greets fair goers with several different speeches. Behind Big Tex is the Cotton Bowl. There was a football game going on there during our visit to the fair. You could hear the roar of the crowd whenever there was a touchdown! One of the things I really enjoy about the fair is seeing all of the buildings in their Art Deco style. They were designed for the World's Fair which was held in Dallas and still look pretty impressive today with their statues and architecture. These two statues were recently restored and put into place. There is some controversy because they are "anatomically correct." Whatever! They are beautiful to see. It seems like every year the fair tries to restore one more thing at the park. In the entryway to each of the buildings there are these large murals stretching at least three stories tall. The colors are rather muted and each represents some aspect of civilization (I think this was film but am not sure!). They are largely ignored by fair goers but are an interesting piece of history! Outside most of the buildings is a lovely statue - again representing different aspects of civilization. I have no clue what this one is but thought it was lovely with its building framing it so nicely. Beyond the architecture, Hubby and I enjoyed walking around the car show and then enjoying some "fair food." How can you go to the state fair and not eat a corny dog (should that be capitalized, I wonder?) and a funnel cake? This year, like the past four or five, Hubby and I took the DART train to the fair. We have to drive about 25 minutes to reach the Dart station but then the train takes us right to the fair. Last year was the first year that the station right outside of the fair was open and THOUSANDS of people took the train. It made our ride horrible - standing in a packed train car (in my case with a bike tire in my back) and then waiting forever at the Pearl Street station to transfer trains (yes, there is one transfer required)! At least this year was better. We actually got seats both coming and going! Yeah! After the long day of walking at the fair we headed to Wendy's for some dinner (I love their baked potatoes with chili and a Frosty!) and then to Home Depot for some much needed items for changing the oil in my car. Doesn't that all sound like fun? It was a full, fun day and we certainly slept well that night! Voice Update: Be proud of me! I have been doing my massage three times a day every day since seeing Susan. Hopefully, it is doing its job! I have also been doing my exercises each and every time I get into my car. Since I am doing observations, that is a lot of exercises being done! Happy Friday! We all made it to the end of another week! Yeah for us! Before you start asking about it . . . YES - I am doing my exercises and my massage. In fact, I just did some massage while I was waiting for the pictures to load to my blog this morning and I am sure I will do some more before getting ready for my day! My neck is still pretty sore from Susan's "work" on it Wednesday but I am working through the pain! As always, the exercises and massage really are making a difference. Sometimes I just wonder why I get so "stupid" and neglect these things. They aren't difficult and don't take much time but they are so very worth it! I guess I just like to pretend that I don't have SD. Then I would be closer to normal! What? You don't think that I can get closer to normal? This morning my mom shared these pictures with me. 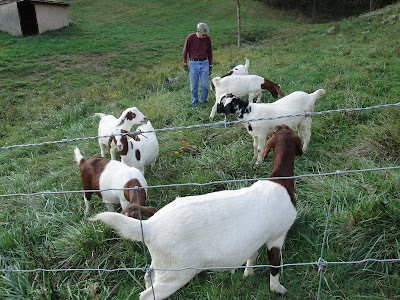 This is Dad in the goat enclosure. He looks like the embodiment of a modern day shepherd! He has his goats (would that make him a goatherd then?) and his dogs . . . he is ready to go! 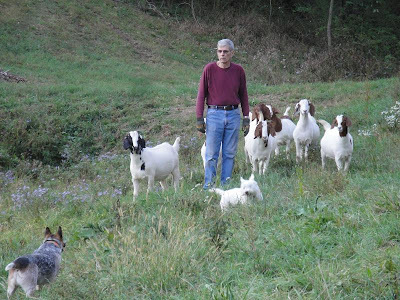 Like any good shepherd/goatherd, he take the time to greet each of his goats . . . He looks to make sure that they are all doing okay. On a totally different subject . . . I just had to share more pictures of Skor. I know it gets boring but he is just so darn cute! How he can sleep in these positions just amazes me! I guess that is all I have to bother you with today. Voice Update: Look at the blurb above - summary: I am doing well with my exercises and massage and shouldn't ever ignore them again! Another day of observations - and a speech appointment - done! Yeah! The speech appointment wasn't surprising (other than the fact that I forgot that I had the appointment in the first place!). I pretty much knew exactly what Susan was going to tell me. I guess that means that I have a good understanding of how SD and I work together on the "dance floor." Susan even said that I was a good judge of what I needed to do to get my voice back on track when SD tries to "change the steps" of our "dance." Of course, my throat/neck was tight - because I have neglected my massage! That means that Susan had to "work" on my neck a bit and that it is sore at the moment. However, the tenderness didn't stop me from doing some massage this morning already. I am determined to get back on the "good voice express!" *** Why am I so into quotation marks this morning? It is a bit odd, don't you think? Anyway - Susan said I was still doing well despite my tapering off of the exercises and massage (which is currently the most important thing I should be doing) but that (wait for it) I needed to get back on track with my routine! Are you surprised? I wasn't! It was good to see Susan again - during all of those months (and years) of therapy we have really gotten to be friends and not seeing her is odd after three years! However, I guess it is a good thing that I am only seeing her every six weeks now instead of every week or every other week - right? **** Do you think that I am now replacing quotations with parenthesis? Interesting! Are you ready for some pictures? Here is Miss Cleo (a little chubby, isn't she??) enjoying her "new" spot in the sun. She looks so peaceful and I love that one of her legs is sticking through the back of the chair! Now see Skor staring at Miss Cleo whose "new spot" is his regular bird-watching spot. I sense a confrontation coming . . . don't you (surprisingly, he didn't pick a fight with her but waited until she moved and then took up his post!)? *** Okay - now I am combining quotations AND parenthesis! What is going on here? While this isn't a very good picture, I wanted to show the fruit that I made and which Hubby (miraculously) ate without saying anything! It had watermelon, pears, peaches, and kiwi. It was very good and very healthy! I must warn you that the next picture is just a bit scary! I took it to show a specific thing but to do so I had to take my makeup off and that revealed "wonderful" dark circles and blemishes. Lovely! Here it is in all its glory (yeah!)! Please ignore the imperfections (if you can) and focus on the lower lid of my left eye (which is on the right side of the picture thanks to mirrors!). Do you notice anything different about that eyelid? Hopefully, you can see that there is a large "patch" of swelling under my eye. It almost looks like a blister. This swelling developed last night (evening) while I was sitting on our couch watching television. I felt something "odd" but didn't think anything of it because this is the season for eye allergies in my life. However - I went to the bathroom and while washing my hands noticed . . . the swelling! I called Hubby into the bathroom and asked him if he had noticed that something was a bit "off" with my eyelid while he was talking to me in the living room. Of course he hadn't noticed anything different (does that surprise anyone? A man not noticing something?). I immediately washed my face and then got an ice pack from the freezer to apply to my face. The swelling went down to a much more manageable size but . . . what in the world could have caused this thing? Hubby did take a close look and said he didn't see any bite marks on the area (and I didn't feel anything bite my eyelid while watching television!). Luckily, this morning the swelling - while still there - is much diminished. Another mystery in my life. I should tell you that when Hubby and I were discussing it he very wisely said "Honey, with your luck, you shouldn't be surprised by this. It is just another thing which would happen only to you!" Voice Update: I pretty much said it all in the blog. Still doing well. Neck sore from Susan's "work." Need to be more consistent with the exercises. I am already on a good track with that. My moonflowers are certainly putting on a show these days! And this was a "slow" night for blooms! Most nights there are about a dozen big, white blooms to look out from the kitchen window! In non-flower news, I am busy (as usual) with class stuff. I am having a good time observing working American Sign Language interpreters and learning from them. I still have no clue how in the world I am supposed to get 200 hours of observation (I currently have 57) but . . . . I will do what I can! My voice is starting to act up a bit . . . it is a little annoying but I suppose it will do that from time to time to remind me about what is going on! Nothing too "big" is happening but I am noticing more difficulty on unvoiced consonants (my nemesis) and finding that once in a while (usually once or twice in a ten minute conversation) I have some "breaks" or "hesitations" happening. I guess I need to step up my vocal exercises. Geez! How many times have I said that in the past couple of months? If only I would actually follow through. Maybe I need to put a post-it on my forehead to help me remember or something like that! I will have to work on that. I could always list exercises on my daily calendar where I put my observations . . . . do you think that would work? Once more it has been a while since I last posted. Blame it on being busy, busy, busy! What a life! I thought I would show some "relaxing" pictures today to insert some calmness into a busy week! My kitties make me laugh. Right before I took this picture, Skor (the big hunk of fur on the left) was kicking Miss Cleo (the brown blob on the right). Miss Cleo was growling but couldn't be bothered to move to stop Skor. I wonder who laid there first? Ah - sunset! How relaxing! I like it when there is a lot of pink in the sunsets - since that is my favorite color! See - pink! I wanted to get closer to the water to see if I could get a reflection of the colors in the lake but . . . we were spelunking so that was out! This sunset was WAY more spectacular in person but . . . I couldn't get a good shot of it. This is the best I could do! This was the view out of the window while Hubby and I were eating out. Doesn't that pink cloud in the middle look like a pig? I had to go outside to get the shot and by then the pig was starting to change into something else. However, when we first saw it - even Hubby (who never sees things in clouds) saw the pig! This is another golf course shot. Sometimes the sunsets are so lovely. In this one the sun hasn't gotten low enough to start making colors other than this gold. I am thinking of putting just sunset pictures on my digital frame in the living room. They can be so dramatic! Well - those are my "relaxing" pictures. Do you feel more relaxed now? Voice Update: Doing fairly well. I did notice that my voice was giving me problems with the "T" sounds and hard C sounds earlier this week. This really makes me frustrated because I have been doing more exercises and massage lately! Huh! I guess I just need to step things up another notch! I guess I can't forget about ABSD even during busy times! Rats!! !